People seem to have very strong opinions about doing open shelving in the kitchen instead of upper cabinets. They either seem to love it or hate it. I thought I'd share my experience with them since I've had them for three years now. I orginally opted for open shelving because I wanted to give my kitchen an open & airier feeling. 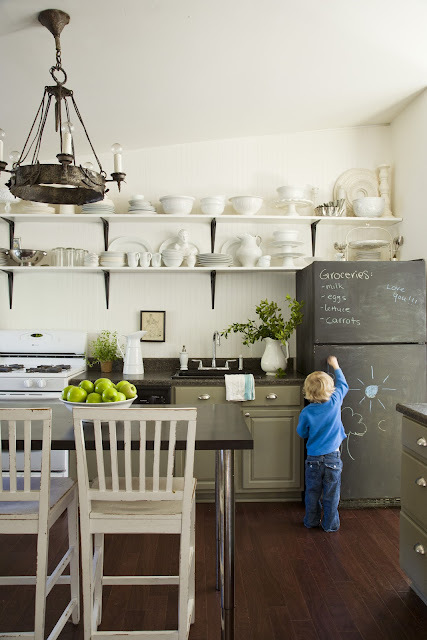 It's a great way to make a kitchen feel larger. My kitchen felt a bit confined & heavy to me so I wanted to visually lighten it up. The assymetrical angle of my kitchen ceiling looked too awkward with a row of dark upper cabinets calling attention to it. SO.. I thought I'd give it a go, more for form over function but I ended up loving the "function" side of it too! One of my favorite things about open shelving is that I can see everything at a glance. Guests too can grab what they need easily or put things back without searching through every cabinet. One of the biggest "cons" I've heard brought up about open shelving is that your things "get dusty" and dirty with cooking grime. Dusty & grimey things have never been an issue for us in our kitchen. We use almost everything on our shelving daily or weekly and it comes off of the shelf perfectly clean because it's constantly getting use. I store a few barely-used items on my upper shelf and when I take them down once or twice a year, there is some dust on them and I simply rinse them off before using them. (Just as I have to rinse off the rarely-used items in my dining room sideboard before use.) Friends of mine who have open shelving have said the same thing. I find it's people who've never actually had it (or who don't frequently use the things on their shelves) who seem to worry the most about this "dust" issue. 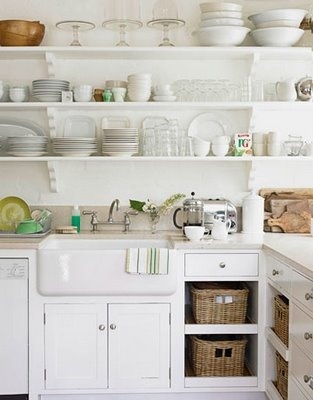 I also love the look of functional beauty in open shelving. A kitchen is for cooking and eating & so I love seeing my "tools" displayed around me. I have collected my platters and bowls and pitchers over time and love being able to enjoy them even when they're not in use. I think they're beautiful and I didn't want to hide them in cabinets. Working in our kitchen is so easy because everything is within reach and I can get to it quickly. (In our house, we move like crazy people. It seems we're almost always rushing -gotta change that- and I can grab things off the shelves like a speed demon.) Putting away the dishes now seems like so much less of a chore than it did when I was putting everything into cabinets. I reserve closed drawers and cabinets for food items and kitchen appliances and my open shelves for the things we use all the time. As with many things in design, I don't think think there's a general wrong or right in uppers vs shelving, just wrong or right for certain people. Personally, I won't ever be without my open shelving in the kitchen (and plan to do it again in our new house because it's perfect for our busy, casual lifestyle- once you go open, you never go back ;) ;) but it's all in the eye of the beholder. Great post. So true about the dust issue. Just rinse it off... what is the big deal? So far I haven't had a client go for open shelves for main storage, but I know more and more will do it! I certainly will in my own kitchen some day. Closed cabinetry is so imposing and boxy. 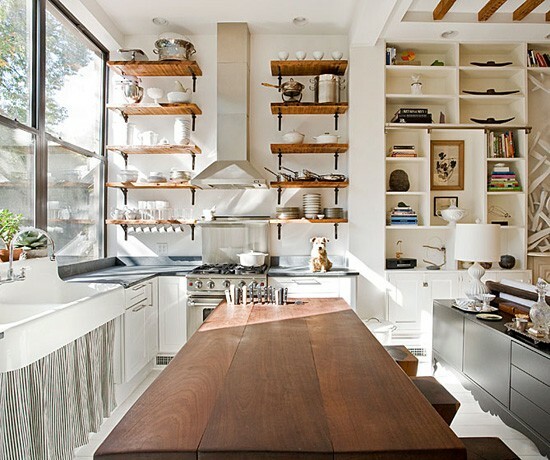 I love the look of open shelving and want it one day when we own our own home again. The dust thing worries me though and I'm so glad you talked about it. We have a cat and I feel like I find her hair everywhere and am worried about that when I'm finally able to have the open shelves. Do you find your shelves get really dusty? I know it's easy to clean off the dishes before using them but the last thing I want to do is get up and dust between everything on the shelves every week. Did you find any issues with that? How often did you dust the actual shelves? Long comment I know, sorry! Can't wait to see what you do in your new home! Great subject for a post! I also went for open shelving in our kitchen - for the reasons you cite - and actually have ended up using it mostly to store cookbooks and cutting boards. We don't cook a lot, so I'm not sure I'd store supposedly everyday pieces, like bowls and plates (which we actually don't use everyday) there. I'm very conscious of not having maximized the space though - I think it's calling out for a pretty display of (mostly) kitchen items that just aren't supposed to get used regularly. Then who cares if they need to be rinsed before use - as you point out, even if kept in a drawer they would need to be rinsed anyway. I also have an antique glass front barrister's bookcase in the kitchen and that is *great* for storing glassware. Really pretty, light and open but dust-free. Great post Lauren and good timing too as I was just speaking with a client who has the same concerns about open shelving. I love them too! You're right about how varied a buyer's taste can be from your own. But honestly, I always come baack to your house pics when I need inspiration for my own home. It's light and airy yet has elements that keep it grounded. Great job overall. I'd leave the shelves open. Your home will speak to the right person. I have always had some sort of open shelving in my 38 years of marriage. I agree with you about the ease of use and the fact that you have to wash seldom used items even in they are stored in a cabinet. In our kitchen redo project, almost all storage will be open. My husband retires in a few years and has not been in the kitchen much. Open shelving will help him "see" where things go. Doors take up room in a kitchen and they cost money to build. I'm putting the biggest part of my budget to great appliances and using open shelving because it suits my needs. 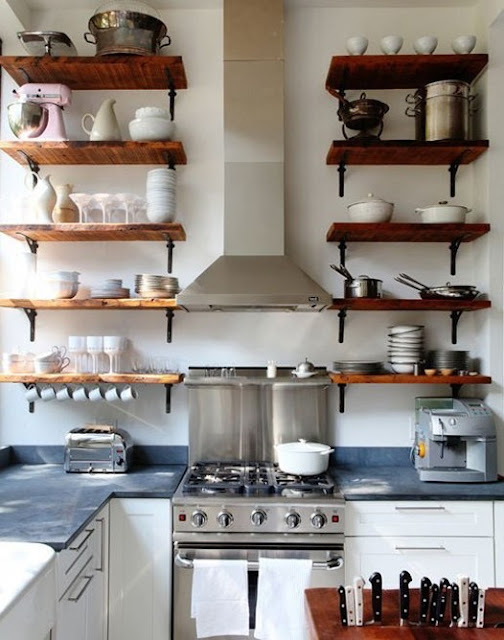 I think that open shelving is popular enough these days that you don't have to worry about it turning too many buyers off, and I agree that your kitchen looks so much more beautiful with the open shelving. We have mostly closed cabinets in our kitchen, with open shelving that is more like an actual bookcase on one wall. This shelving unit contains all of our pots and pans, mixing bowls, and cookbooks. The things on the lower shelves (large pots) do get dustier and are more likely to collect cat hair than the things higher up. I have no problems with dust on anything higher up that gets used regularly (i.e. I need to rinse dust off the canning pot, but my other pots and pans are always fine). 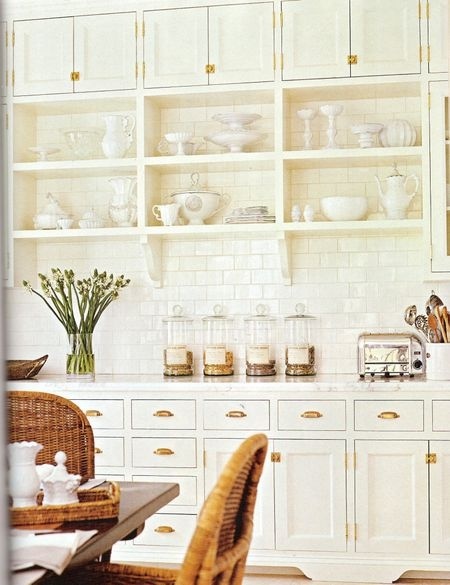 When we get to redo our kitchen, I don't know if we will do open shelving throughout, or only in certain places. I think that open shelving looks best if there is a lot of color continuity in the things on the shelves. We have blue fiesta-ware plates and glasses with superheroes on them, some colored glasses, a collection of mis-matched mugs, not to mention the food stored in the cupbords. I fear that it will look junky. It's not the dust that gets me - its the grease. I have some open shelving - and while it is not things I use all the time - the items that are on them need to be scrubbed before using - not just rinsed. They seem to accumulate a sticky layer of kitchen grease that the dust then settles on. While I think they look pretty, they are not for me. 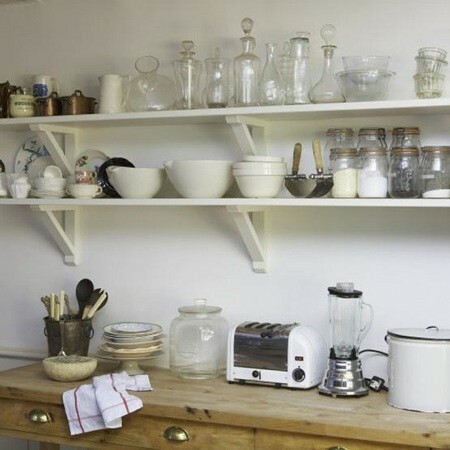 I did open shelving in my 1940s kitchen (that had no cabinets at all!) after being inspired by yours. I love it. A little dust never hurt anyone. And it got me in a BH&G book. So there you go! I've had both and much prefer closed storage. I second the comments on grease/grime/pet hair and To me, closed cabinetry is less visually clutter. we recently remove all upper cabinet and have all storage in drawers below. To me this is the best of form & function. But your house is gorgeous & I am sure your potential buyers will agree!! Can't believe you are moving so fast! Good luck with the sale of your house! I love your kitchen makeover and your collection on your shelves. I do not like open shelves that are junky,cluttered and not styled. Gotta show decorating skills! I love your white collection, it is display worthy! Totally agree with every point. I have open shelving and absolutely love it. Like you would not be without it. Your kitchen is lovely. Good luck with the quick sale of your house. Your collection of dishware is beautiful, so you're right, why hide that all away? I love the look of open shelving, and think it was an especially genius way to draw attention away from the sloped ceiling in your space! Loved hearing more about the 'myths' of the open shelving. I have loved that last kitchen with the dog on the counter since it was first published, but if they really keep their KitchenAid mixer on that high shelf they must never use it. You'd need a crane to get it up and down! We recently added open shelves and love them- alays a bowl at hand to make an ice cream sundae. I think open shelving is a great option. I am designing them into our next home. 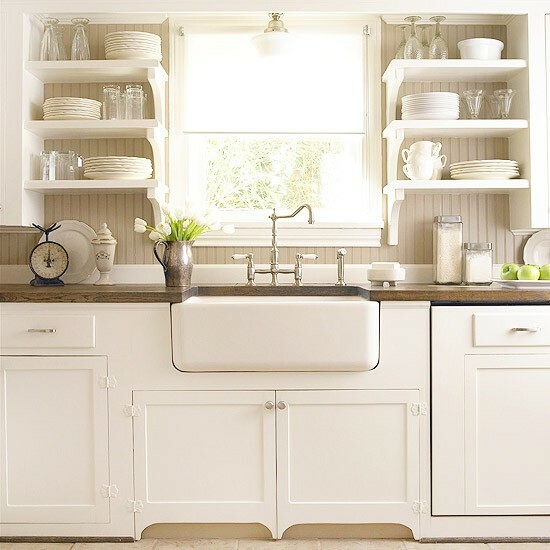 I am just about to start a "cheap & cheerful" kitchen reno, inspired by yours and other bloggers which rests on the idea of taking down ugly old cabinets and putting up open shelving - form and function combined. I am planning on "practical but attractive" by the stove and cohesive groupings of mostly white dishes on the other side of the room. Our extra kicker is that we are only in this home for the summer months, so I was actually thinking of dust sheeting the shelves with some plastic while we are gone. But I may not even bother - just might have to run everything through the dishwasher when I return next year! I'm with you on this. 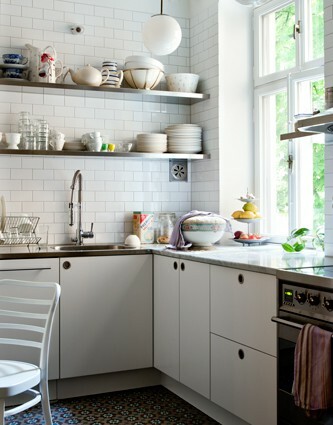 I LOVE open shelving in the kitchen and I have a lot of it with beautiful kitchen wares displayed which I just change for a whole new look. Good luck with the sale. Your kitchen looks amazing! Open shelves!! I chose open shelves for our new kitchen - iron brackets with grey-weathered antique barn wood - love!! 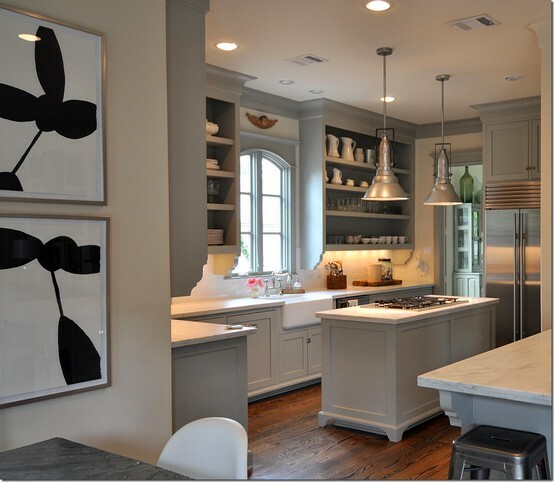 It really does look so great against the white painted plank walls, dark counters and white shaker style base cabs, vintage lighting. Sigh! I've only had them for a couple weeks but just love them so far. So easy to grab what you need, single handedly, from the shelf. As for grease, I chose to get a Jenn Air down-draft range for this very reason- the draft is so efficient on these ranges, there is no grease to gather on shelves/dishes! A high quality range hood would probably do the same. Great post, Lauren, and I think you'll do well with the sale of your home. Can't wait to see the new one come together! So so heart warming to go back and read your moving story. You guys have come such a long way. It will be so wonderful to watch you make your new house a home. I can't wait. Congratulations. Good luck with the packing stage. And for what it's worth. . .open shelves rock hard. I have re-done three kitchens since living in FL. Two (ours) the first thing I did was rip out the upper cabinets. Makes me feel I can breathe! I think key is having GREAT storage below. This kitchen we have tons of banks of 36 inch drawers...for pots,for other dishes. But the walls are all shelves. Same with our last kitchen 10 years ago. I would never go back to upper cabinets! I think your gorgeous home will sell in a song! Hi Lauren, I just talking with my husband this week about re-doing our kitchen. I've always loved the open shelves idea. Nice to see you do too. Good luck with your sale! When we sold our house, we laid pictures out of the backyard in every season to show the real beauty of the yard. The family who bought the house commented on how much they liked seeing the photos. If a prospective buyer happened to see the 'before pictures' of your kitchen, it would make them truly appreciate the concept. Good luck with the sale. The property is beautiful and I love the open shelving. I do admit to loving a bit of both. I have two open shelves by my bar area and glass front cabinets by the serving area. Love all the images you posted. Well we are getting a new kitchen later this year and I'm definitely having some open shelves and no upper cabinets. I am actually sick of opening cupboards every five seconds. But it will only be for the crockery I use every day/week. Also the kids can empty the dishwasher straight onto the shelves... No more excuses "I left it out because I don't know where it goes". Like you though I will have mainly white, I just loved your kitchen by the way. I'm sure your house will sell in a flash! We gutted our kitchen last year and now have no upper cabinets. I feel like I can use all my countertop now. We have two shelves for everyday dishes and glasswear which gets used constantly and does not gather dust. I would not recommend open shelves near the stove however. Please please keep us updated with the comments you receive from prospective buyers. I am sure your home will be sold within the week! Your style and furnishings make all the difference. Can't wait for the new adventure to begin! Good luck with your house sale! I am sure it will go to the highest bidder!!! I couldn't agree with you more Lauren! I adore our open shelves for all the same reasons you like yours. I haven't had any problems either with dust or grease but maybe my shelves aren't close enough to the stove? They are maybe a foot or two away. I cook six or seven nights a week so I would think if anyone was going to get grease it would be me. I will always do open shelves too. Congratulations on putting your house on the market! I know it will be an exciting and emotional time. I think everyone who walks in is going to fall in love with it. And selfishly, I can't wait to see what amazing things you do with the next house! Good luck. Great post! Last year I added some open shelves to my kitchen... choosing open shelves was decided up because of cost, however now having them, I do not know if I would ever go back to closed shelves, because I love them! They are so fast to get to things, help guests out in finding what they are looking for, and I like how they opened up our kitchen. Good luck with your open houses! I'm not mentally stable enough for complete Open Shelving. But I love the look. 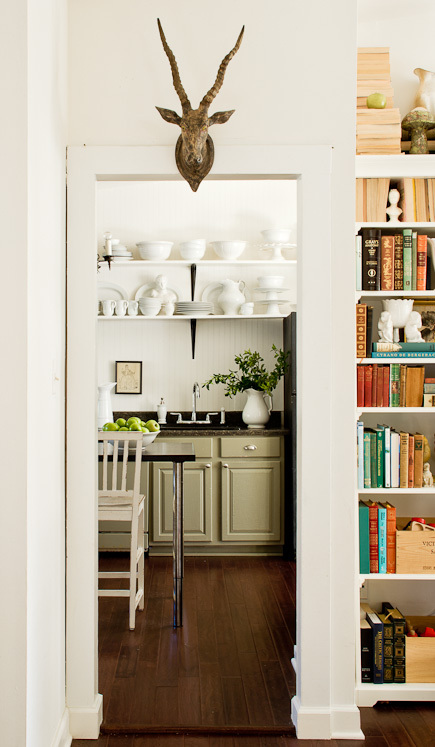 I'm a huge fan of open shelving, too, for all the reasons you stated! I do have some upper cabs with glass doors as well, but my everyday stuff goes on the open shelves. It's so easy, and like you, I love seeing my favorite things every day. Where did you get your shelves and brackets from? They have just the right amount of character. Thanks Lauren! Oh good when I saw the post I was afraid it would be a no on the open shelving and I am so looking forward to it in our new house (9 days and counting) I love the look and can't wait to give it a try, thanks for the heads up. These are beautiful pictures! I think people who complain about the dust on their open kitchen shelves probably really need a new ventilation system for their stove. When we had open shelves above my stove pre-renovation, my cookbooks got very greasy and dusty. BUT, we only had an unvented stove hood so the stuff had to land somewhere! Thanks for sharing! Great post and thanks for sharing your experience with open shelving! I've never had it but would love to open it up in another home in the future! I love your kitchen !! This would make a great Cultivate article. They've done something similar (pros and cons or side-by-side comparison), but your photos and experience give this a different spin and make for a better article. Would be good exposure. Congrats on the new house. Smiling that you were worried about the response to yours and a quick sale. You have excellent taste! You should submit this to Cultivate as an article. They've run something similar, but yours is better. I adore your shelves, and get the idea that if it's used often, no problem! But in our house, we do have problems with the dust issue... I have a white bookcase filled with my seldom used bowls/colander/platters. I love the way it looks, but we also have a wood stove right next to it and 2 cats and 2 dogs... The amount of dust that wood stove kicks off in the winter is awful! And since this bookcase and the woodstove are right next to each other on the perimeter of my kitchen, there is always a layer of yuck (hair/soot/dust) on my stuff. I love also your shelves and you did a good job. It is well organized and I like the way you arrange it. All was fabulous. Thank you.